If you are an expert who instructs trainers or instructors, or prospective trainers and instructors, how to improve their techniques and skills, you have a truly unique business that needs to be well insured. You are a professional who trains professionals or would-be professionals, therefore it is your unique judgment and expertise that you are passing on to improve their professional skills. The more you know and the more you present yourself to the public as an expert, the higher your Professional Liability Exposure will be. You may be doing seminars and demonstrations or long term courses. You may be providing a certificate to participants who complete your courses satisfactorily. You may even be testing, ranking, and certifying them in their skills. Therefore, you have two liability exposures to be concerned about. The first is for General Liability and the second is Professional Liability. The purchase of one without the other is not adequate for your protection. Many Insurers do not offer Professional Liability Coverage, and some will only offer it without General Liability. In reality, both coverages should be offered together by the same Insurance Company, and we are able to provide both under one liability policy. Professional Liability Insurance does not take the place of general liability, but is complimentary to it. Professional Liability Insurance does not provide important Premises & Operations liability coverage that General Liability Policy does. Therefore, professional liability is not offered as a stand-alone policy. It is added to the general liability policy by endorsement for each qualified professional who is listed in the policy by name. There is a separate premium charge for this important coverage. General Liability Insurance for commercial equine operations protects you from financial loss should a client / customer become injured or their property is damaged in relation to your horse activities, and the damaged client attempts to hold you financially responsible for negligence. Equine Professional Liability generally pays for those sums the insured professional becomes legally obligated to pay as damages because of “bodily injury,” “property damage,” “personal injury,” “prize money losses” or loss of value of a horse to which coverage applies caused by a “professional incident.” A “professional incident” usually involves an improper professional judgment by the Insured when providing a service for which there is higher than average expectation of outcome according to the high qualifications of the professional. While the GL section of the policy names the individual, partnership, trade name or corporation as the insured, the professional liability endorsement must state which individuals are insured as professionals for their line of work. As a Professional Instructor to Instructors and Trainers, you worry that you may be sued or otherwise have a claim made against you. If sued, you will need to hire a lawyer to defend you and you wonder how you would go about doing this. If found negligent or responsible, you would likely have to pay for either a court-ordered or agreed-upon settlement to the injured party. Fortunately, much concern can be relieved when you buy a Commercial General Liability Policy [GL] with Professional Liability Coverage to insure your instruction activities. How Risky Are Horse Rescue Operations? Moderately High. It is the instructor’s expert status and issues pertaining to professional judgments that cause this type of training and teaching to be in a moderately high risk category. Horse activities are reasonably safe compared to many other activities people participate in. Yet, horse-human activities do carry inherent risks. Accidents do happen when people at different stages of capability attempt to touch, handle, train, ride, drive and control large animals that are unpredictable even when well trained. And some horse-human accidents are serious. Even with the best of intentions and management practices, anyone can have a claim made against them and be sued. As a stable property renter, you may not have access to property insurance for tack, equipment and machinery you use in your business. Ark Agency can insure these items by adding a Property Coverage Endorsement to the General Liability Policy. The items and values must be declared in the application process and additional premium is charged for this endorsement . Medical Expense: Pays for low cost medical expense with no questions asked about your liability or responsibility in the matter. 1. A student rider or handler becomes injured during or in relation to instruction. The greatest potential hazard lies in the fact that the student needs to progress in their learning, but to do so they must take moderate chances and perform in ways they’ve not done before. Trainers can have the same thing occur when trying to teach someone how to handle or ride a horse they are training. Students sometimes simply lose their balance and fall or will just bail off the horse. They often fail to apply proper cues to control or guide the horse – some may be too harsh and hurt the horse and the horse reacts in a way that is unsafe for the handler. While on the ground, a student can be bitten, kicked, bumped, dragged, fallen on, or stepped on. Incidents often occur during a gait transition, or when jumping, or maneuvering over obstacles. A horse can “spook” and react at any time and from any distraction, depending upon the animal’s mood of the moment and stimulating factors that may arise. It can take time for a student to gain balance, a secure seat, good horse handling instincts, and confidence. To protect themselves when frightened or in pain, a horse will often run forward, stop suddenly, jump sideways, kick out, rear up, buck or crow hop. Common human injuries are soft tissue, broken arm, injured tail bone or back, bruised or broken ribs, shoulder, and sometimes head injury. 2. 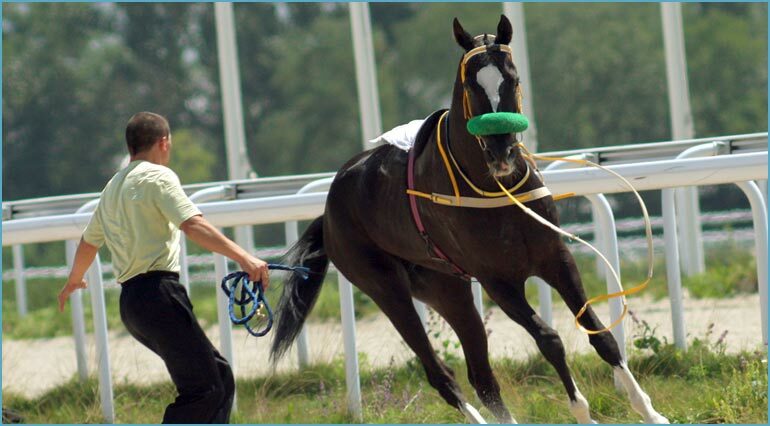 Horses in training become injured or may even die while in the trainer’s care, custody or control. Horses can become injured during the training process when challenged to learn something new, and when handled and integrated into a strange environments. Borrowed school horses can be injured while the instructor is preparing for or teaching a lesson. A student’s horse can become injured when the instructor rides it for behavior and gait assessment or correction purposes. 3. A horse gets away from the trainer or instructor at a show, runs into the road and is hit by a car. The horse must usually be destroyed, while property damage to the car and bodily injuries to passengers can result in a sizeable multiple claims from just one incident. Your insurance needs are unique, therefore we believe in person to person service. Call or e-mail an Ark Agency Representative for an estimated premium, policy and company details, and qualification requirements. We work with several insurance companies and rates and coverage conditions vary. We will help you determine which application to use and advise on how to put insurance in force.